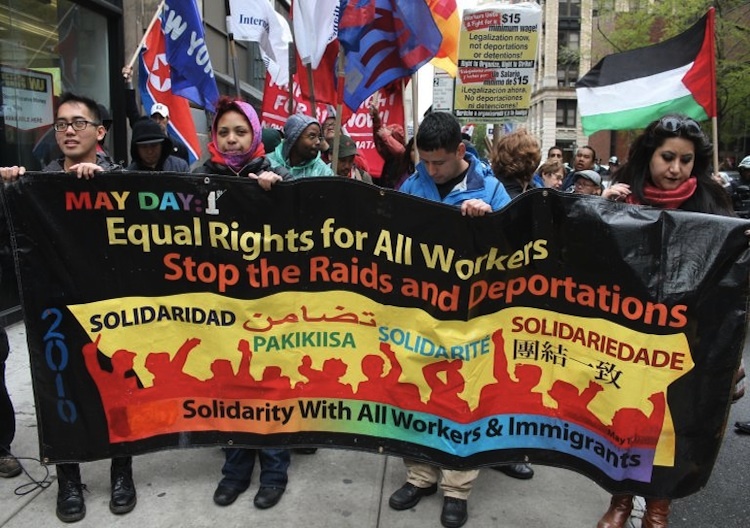 This May Day we will see millions of immigrants, young and old, strike to defy Trump’s intensification of a brutal campaign that has already deported millions of people in the Obama years. This May 1st, we expect crowds in the streets of nearly every US city to multiply beyond the 1.5 million Mexican and Central American immigrants who marched eleven years ago. This year’s crowds will include millions more people who are directly targeted by Trump and Trumpism. Alongside them will be millions of others who are outraged at this ugly, undemocratic union of white supremacy and corporate interests. This year’s crowds will be swelled by Muslims who Trump has targeted for bans, deportation and harassment. LGBTQIA people whose very recent civil rights gains and protections are being reversed will join. Black citizens whose voting rights and physical safety are under attack by Trump and his supporters will come out, along with Latinx and Asian Americans who understand the danger to their communities. Union members, who know that destroying unions is a central part of the Trump/right wing strategy, will demonstrate in large numbers this International Workers Day, with the active support of the AFL-CIO. Thousands who joined the April 29th People’s Climate Marches to protest Trump’s climate denial will march again today to denounce his support for the Dakota Pipeline, which threatens native land, water and sovereignty. Peace activists will speak out against Trump’s bombing of Afghanistan and Syria, which is not in the interest of working people anywhere. That’s something really big to celebrate: more than 50 social and racial justice organizations uniting our movements around shared values and intersecting struggles like sanctuary for all, food justice, Indigenous land rights, reproductive rights, the criminalization of Black and Brown people, immigration, income equality, LGBTQIA rights and more. FRSO has signed onto this exciting project that plans to work through both political education and mass mobilization to “put forth a true, collective vision of economic justice and worker justice, for all people.” As we on the Left intensify our fight against the right wing–which has always felt entitled to put forward a vision to lead society on behalf of a small minority–it’s very exciting that a Left coalition is now stepping forward to claim the right to lead on behalf of the true majority: the movements of the multiracial working class, people of color and all oppressed people. This May Day, we would like to emphasize one element that we see as a critical link for making the Majority’s vision a reality: that is, the need to win more control of institutions and positions in the government (state apparatus) and to use the electoral process as a key arena to build our Majority. No matter how powerful and united we build our movements, a protest-only path to power is severely limited. We need to be able to build movement and organization that allows us to combine protest work with electoral strategies for base building. The new Majority coalition’s fight to construct a true majority vision and bloc will build the core we need: advanced fighters against austerity, white supremacy and patriarchy. But to defeat the right, win our freedom and transform the world, we must build political power on a very large scale. Even if we all get together, the Left does not have the ability to defeat the right on our own, and we will not be setting the terms of political engagement in the US for a while. In a polarized United States where the political terrain is dominated by Republicans and the right-wing—even though they are a minority of the population—socialists and others on the Left MUST bring our vision of liberation and socialism and our lived experience of intersections into the vastly bigger, messier arena of mass politics. We must develop our theory and practice of the united front strategy. The Majority coalition and similar advanced fighters make up our strategic alliance, our core. But to win against the right, we will have to make tactical, temporary alliance with the center and with corporate Democrats on issues of shared interest against the right—for example, defeating voter suppression or anti-transgender hate bills. And we need to learn from the right’s strategy, which is neither local nor national, but which focuses on capturing and controlling the STATES. What we call the ‘New Confederacy’ and see as our immediate enemy has cohered a ‘white united front’ to aggressively pursue austerity politics at the state level in the majority of states in the country. Their agenda is the Koch Brothers/ALEC playbook: attacking unions, public services and public employees, voting rights, GBLTQIA rights, reproductive rights, environmental regulation and renewable energy; and promoting voter ID laws, charter schools, fracking and pipelines. The New Confederacy uses its power in the states to pre-empt or reverse progressive legislation at the local level and to obstruct things at the Congressional level. They also use their foothold in the States to gerrymander districts, dilute the voting impact of communities of color and suppress the Black vote, which ultimately allowed Donald Trump an Electoral College victory even though he lost the popular vote. This map shows the ‘Trifecta” states, where all three governmental bodies (Governor, State Legislature, State Senate) are controlled by one party. There are state trifectas in 31 of 50 states, and 26 of them are controlled by Republicans (6 by Democrats). To advance this state-level strategy, FRSO/OSCL is supporting and experimenting with Independent Political Organizations (IPOs) as an organizational form that can put forward a socialist vision, even as it builds a base and works an ‘inside/outside’ strategy. This inside-outside strategy has two dimensions: it builds power inside and outside of the electoral arena, as well as inside and outside of the Democratic Party. We are inspired by some pioneering IPOs such as Take Action Minnesota, The Working Families Party, National People’s Action, and New Virginia Majority. We are encouraged that even more groups are trying different ‘inside/outside’ strategies. Our Revolution and the Democratic Socialists of America are laying claim to the Democratic Party apparatus by electing delegates at all levels, promoting progressive/left platforms and running for office against Republicans in red states and against corporate Democrats in blue states. Freedom Road is working to cross-fertilize these efforts: to engage the new Bernie-inspired electoral activists more directly with our advanced movement bases and our long-terms fights; and, similarly, encouraging our multi-racial working class groups and leaders to contest for office and use electoral cycles to build our forces. We believe that this is our opportunity to bring together forces that need to be together in order to transform this country. It is our duty to use the fight against the right to build the left in a way that can lead a majority of people in this country.